Orders placed before 1pm will qualify for next day delivery, but please allow up to 48 hours for delivery. If you need a product urgently we can offer weekend & early a.m. deliveries, however, there may be an additional charge for this. Please contact us for more information. We distribute across Europe, but currenlty our website will only allow UK, French & Republic of Ireland delivery addresses. If you require a specific quote please contact us. There are certain restrictions and rules when shipping pesticide products. This depends on the volume, weight & the toxicity of the product. All of our products are shipped using Limited Quantity & ADR regulated couriers and comply with all current legislation. All our products are packed securely and are clearly labelled with the product information, quantity, UN numbers and the class of the product. This is the reason that shipping is slightly more expensive than sending a standard parcel. There will be an additional charge If you are ordering product to The Scottish Highlands, Channel Islands, Scottish Isles or Ireland & other European Countries. Enter your postcode as normal and the system should calculate it automatically. There may also be a surcharge to heavy pallet orders; this only applies to areas outside of mainland UK. Please contact us for a detailed price. Pallet deliveries by lorry: When accepting pallet deliveries, there must be a suitable place on hard standing where the lorry can deliver the pallet. It must also be made clear at the point of purchasing on any specific restrictions on lorry size or unloading, for example if you do not have a forklift to unload the pallet so require a lorry with a tail lift to deliver. Failure to do this may result in further charges being incurred by the purchaser. We must also have 2 telephone numbers for hauliers to contact you with any issues. You are able to use the Click & Collect option on any order from our website. Due to the volume of orders, we receive you are only able to collect the order the same day if it is ordered before 12noon, if not then it must be collect the next working day. Where possible we will try to get goods turned around quickly but would always advise you call in advance. Our new, purpose built office & warehouse 'Gem House', was formally opened on 10th Feb 2017 by Professor John Moverly OBE who is Chairman of The Amenity Forum. 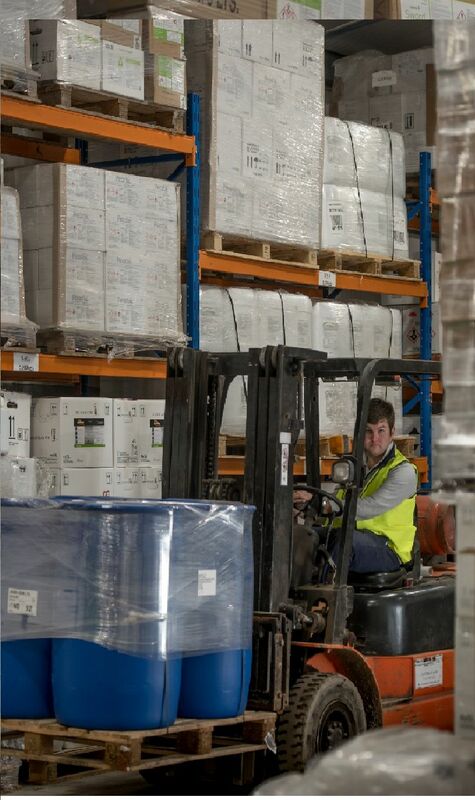 Our specialist bunded warehouse is capable of storing 185,000 litres of hazardous product which ensure's we can hold a large amount of stock to be able to cater for next day deliveries - large & small. Our warehouse was specifically designed to meet & exceed all of the environmental & legal requirements for storing hazardous goods. Currently we opperate from over £1million of purpose built warehousing with further expansion plans on the horizon.